Whew. Is that the longest title in the world for a snack or breakfast so simple? Probably. But these little bars pack a lot of punch. I could just simplify things and call them Good Bars, and the result would be about the same. As I have mentioned, I am no food photographer (but my baby and toddler iPhone snapshot skillz are on point, if you’re in need), and these aren’t exactly picturesque, but we’ve all been munching on these this week. 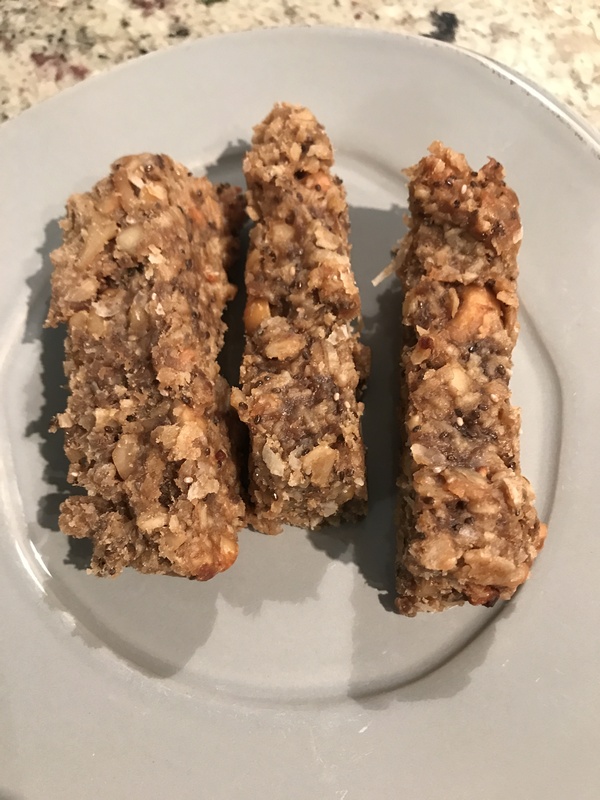 Our household doesn’t subscribe to a gluten free lifestyle, but several of my friends do, and these just happened to fit the bill and perfect shareable and freezable. And while I am a diehard devotee to my Zone Fudge Graham bars in a pinch, these may edge them out. Preheat oven to 350. In a mixer, combine the bananas, peanut butter, honey and vanilla until smooth. Mix in oats and nut/seed mixture until combined. Pour into a parchment-lined 8 x 8 baking dish. Press with a spatula until evenly distributed in the dish. Bake for 30 minutes, or until golden brown around the edges. Cool completely before cutting into bars.